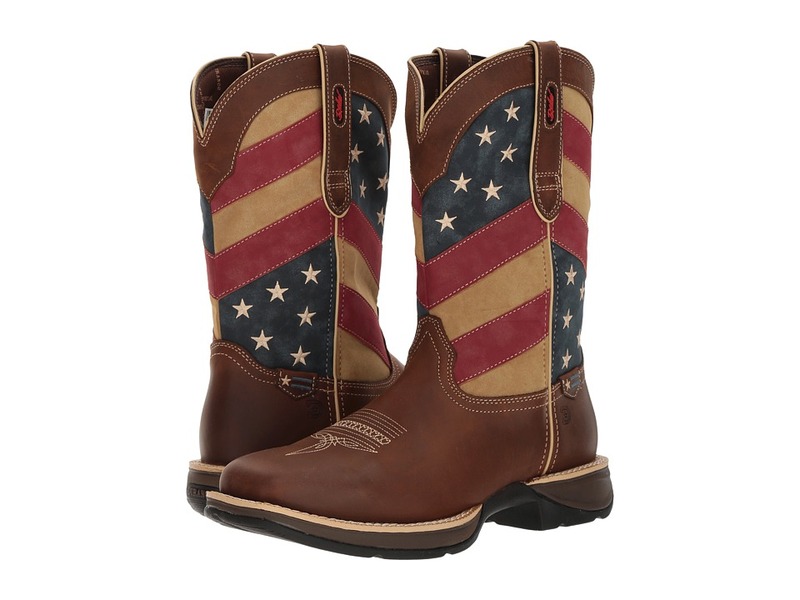 Your true American style will be on full display with the patriotic flair of the DB5554 - Flag boot by Durango. Distressed full grain leather with American flag design on shaft. Soft textile lining for added breathability and comfort. Cushion Flex insole with a contoured, ventilated, removable, and cushioned footbed. Square toe. Rocker heel. Tempered steel shank with a rolled shank area. Double row welt stitch. 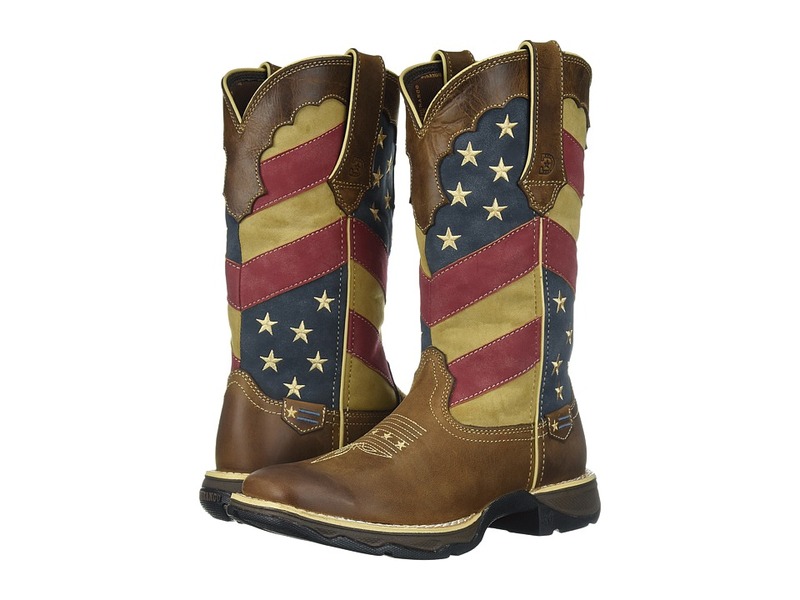 Durable translucent rubber outsole features a flag graphic. Imported. Measurements: Heel Height: 1 1 2 in Weight: 1 lb 6 oz Circumference: 14 1 2 in Shaft: 10 1 2 in Platform Height: 1 in Product measurements were taken using size 11, width D - Medium. Please note that measurements may vary by size. Weight of footwear is based on a single item, not a pair. 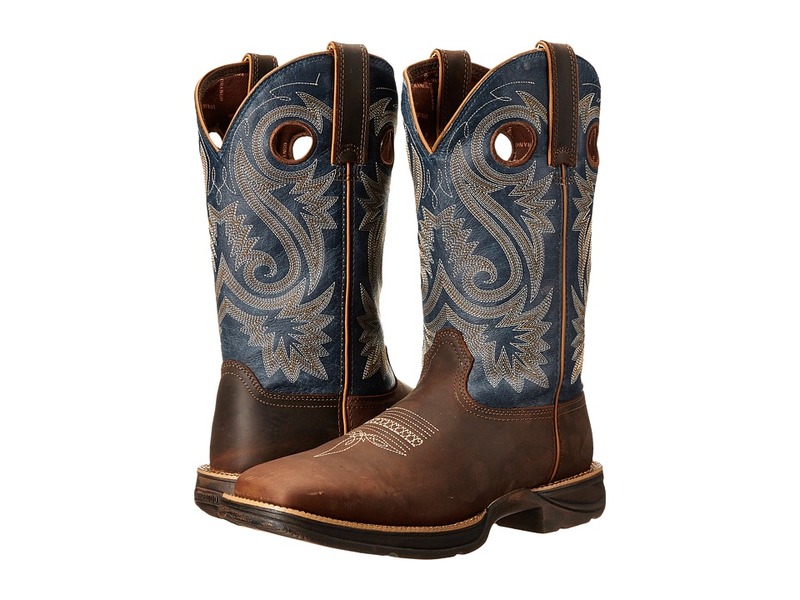 The Durango Rebel 12 Western boot is a durably tough boot designed with the modern cowboy in mind. Full grain leather upper with a classic Western stitching on shaft. Side pull straps for easy entry. Fully leather lined for a comfortable fit. Removable cushioned TPE footbed is contoured and ventilated for air circulation for excellent all-day comfort. Footbed features added memory foam for even more comfort. TPE midsole provides is oil resistant. Wide square toe. Leather welt with double row welt stitching. Tempered steel shank provides reliable arch support. Rolled shank area. Rocker heel for excellent stability. Dual-density rubber outsole. Imported. Measurements: Weight: 1 lb 5 oz Circumference: 15 in Shaft: 12 in Product measurements were taken using size 11, width D - Medium. Please note that measurements may vary by size. Weight of footwear is based on a single item, not a pair. 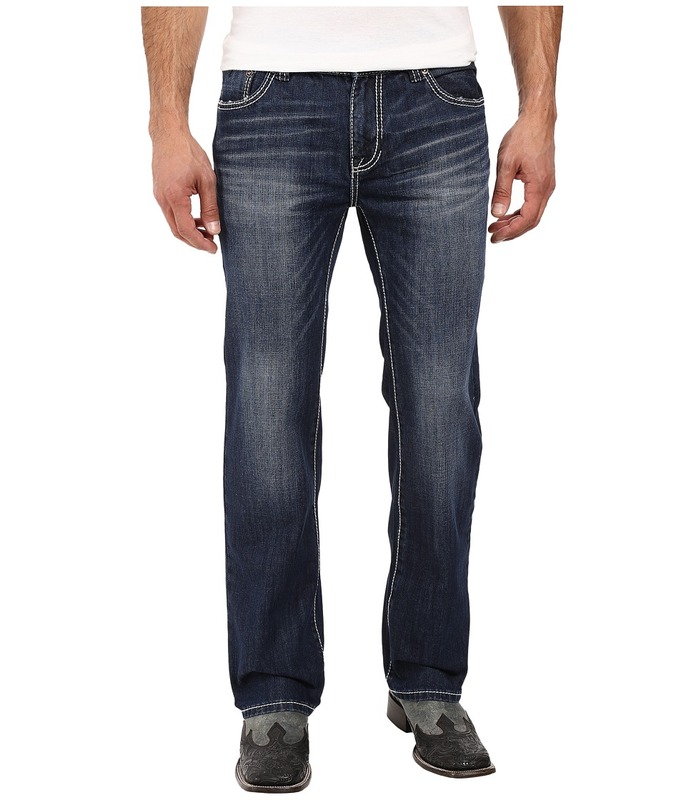 Reload on this durable, clean look with the Rock and Roll Cowboy Double Barrel in Dark Wash jeans. Relaxed fit pant is eased through the thigh with a straight leg. Dark blue wash denim with whiskering, hand sanding, and contrast stitching. Belt loop waistband. Zip fly and button closure. Classic five-pocket construction. Embroidered design embellishes the coin and rear patch pockets. Brand patch at right rear waist. 100 percent cotton. Hand wash, line dry. Imported. Measurements: Waist Measurement: 32 in Outseam: 42 in Inseam: 32 in Front Rise: 11 in Back Rise: 13 in Leg Opening: 8 in Product measurements were taken using size 32, inseam 32. Please note that measurements may vary by size. Train your dead-eye aim on the bull~s eye and pull the trigger in the handsome Pistol Bootcut. The Pistol fits straight through the thigh and kicks out below the knee to a bootcut leg. Classic, comfortable mid-rise waist. Medium wash features a bright blue character with whiskers and allover sanding that draws out the textured, crosshatch character of the rigid denim. Grinding at the edges finishes the worn-in look. Leather brand patch at the back waist. Signature stitch sets off the coin and back pockets. Contrast stitching. Branded rivets and shank-button hardware. Belt-loop waistband. Zip fly and button closure. Five-pocket design. 100 percent cotton. Hand wash and line dry. Imported. Measurements: Waist Measurement: 32 in Outseam: 42 in Inseam: 32 in Front Rise: 9 in Back Rise: 14 in Leg Opening: 16 in Product measurements were taken using size 32, inseam 32. Please note that measurements may vary by size. 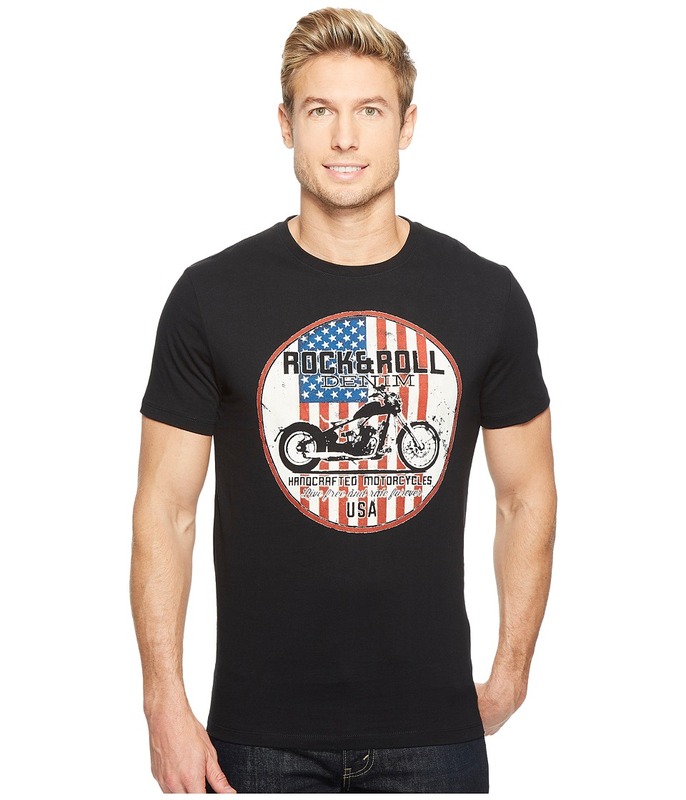 Stir up conversations and get the best reactions while rocking this patriotic Rock and Roll Cowboy tee. Regular fit with a slight body skimming appeal. Durable cotton fabrication offers superior comfort for all-day wear. Crew neck. Short sleeves. Vintage-inspired screenprint of motorcycle with American Flag displayed text across front. Straight hem. 100 percent cotton. Machine wash, dry flat. Imported. Measurements: Length: 29 in Product measurements were taken using size MD. Please note that measurements may vary by size. Shine bright and bring back life to the corral with this robust Rock and Roll Cowboy Polo. Regular fit skims the body and allows unrestricted range of motion. 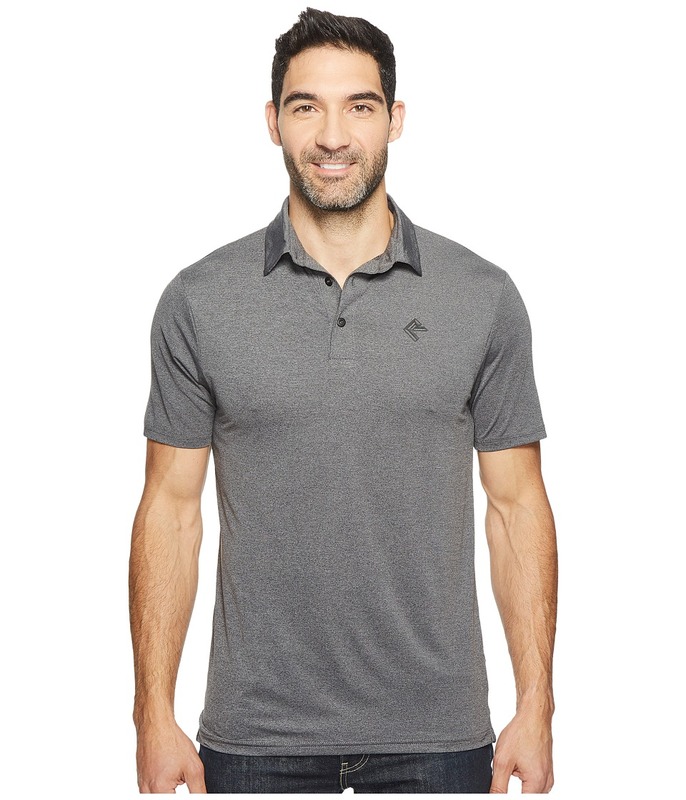 Lightweight fabric offers supreme breathability and all-day comfort. Spread collar. Three-button placket. Straight back yoke. Short sleeves with ribbed cuffs. Embroidered brand marking at upper right. Straight hemline. Straight hem with side vents. 100 percent polyester. Machine wash, tumble dry. Imported. Measurements: Length: 30 in Product measurements were taken using size MD. Please note that measurements may vary by size. 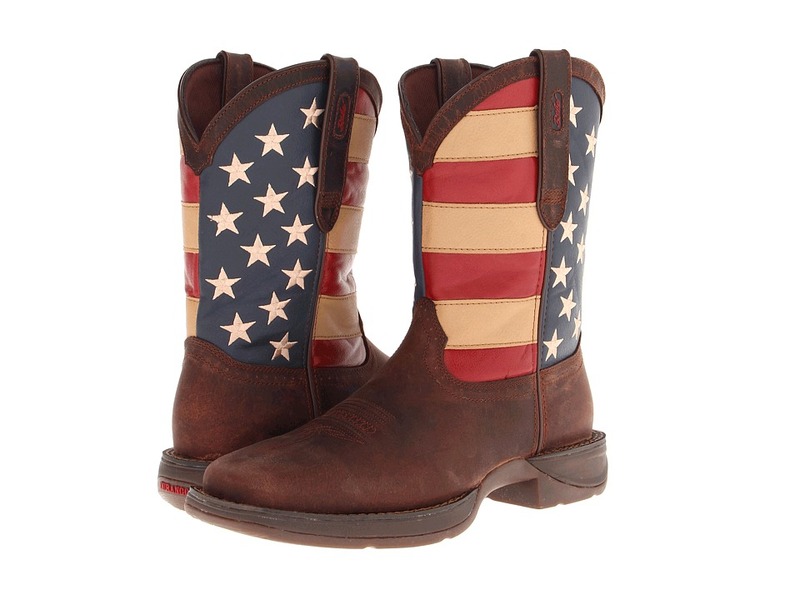 The Durango Lady Rebel 11 Flag boot offers a little rebellious attitude at just the right time! Distressed full grain leather vamp, collar, and strap and a man-made shaft. Shaft features an American flag design with embroidered stars. Side pull straps for easy entry. Breathable mesh lining for a comfortable fit. Cushion flex insole with a removable cushioned TPE footbed is contoured and ventilated for air circulation for excellent all-day comfort. Lightweight and flexible molded EVA midsole provides added support and shock absorption. Square toe. Double row welt stitching. Tempered steel shank provides reliable arch support. Rolled shank area. Rocker heel for excellent stability. Dual-density rubber outsole with abrasion and slip resistance. Imported. Measurements: Heel Height: 1 1 4 in Weight: 1 lb 1 oz Circumference: 12 1 2 in Shaft: 10 1 2 in Platform Height: 3 4 in Product measurements were taken using size 8, width B - Medium. Please note that measurements may vary by size. Weight of footwear is based on a single item, not a pair. A little rebellious attitude at just the right time! Tall Western boots of premium leather. Faded flag treatment with embroidered stars. Side pull straps for easy entry. Fully leather lined for a comfortable fit. Removable cushioned TPE footbed is contoured and ventilated for air circulation for excellent all-day comfort. Footbed features added memory foam for even more comfort. TPE midsole provides is oil resistant. Wide square toe. Leather welt with double row welt stitching. Tempered steel shank provides reliable arch support. Rolled shank area. Rocker heel for excellent stability. Dual-density rubber outsole. Imported. Measurements: Weight: 1 lb 7 oz Shaft: 12 in Product measurements were taken using size 11, width EE - Wide. Please note that measurements may vary by size. Weight of footwear is based on a single item, not a pair. 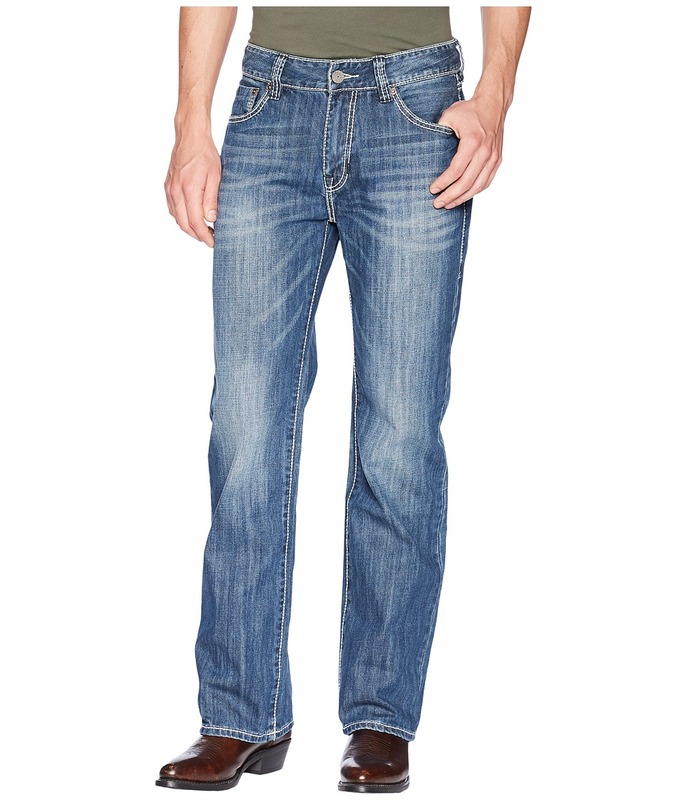 Highlight your day with starting your day feeling supported in these vintage Rock and Roll Cowboy Jeans. 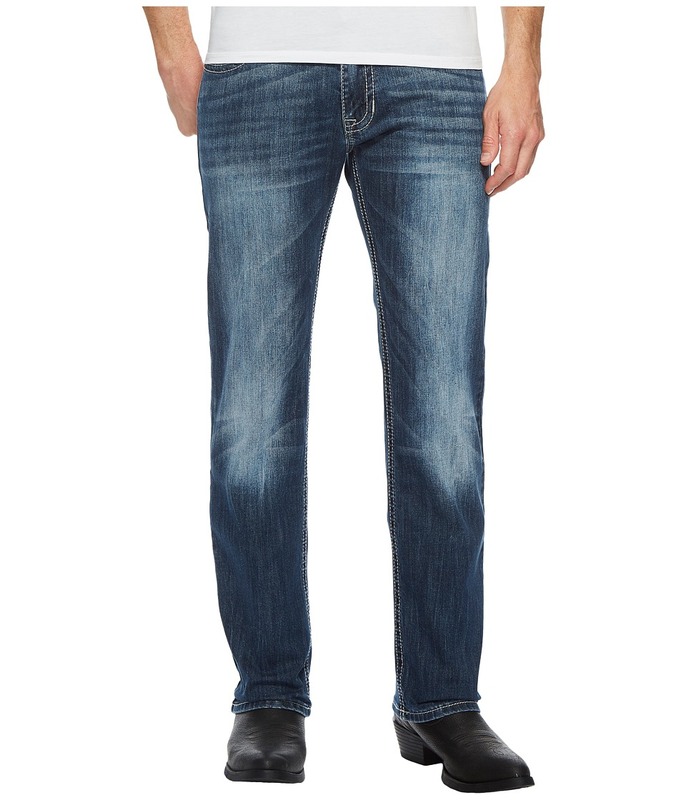 Mid-rise jean sports a tailored fit that cut straight through the hip with a slightly tapered leg. Stretchy, medium washed denim sports starbursts, heavy hand sanding lending a vintage look. Belt loop waistband. Zip fly and button closure. Classic five-pocket construction. Contrasting V-stitching details along rear pockets. Brand patch at right rear waist. 99 percent cotton, 1 percent spandex. Machine wash, tumble dry. Imported. Measurements: Waist Measurement: 32 in Outseam: 41 in Inseam: 32 in Front Rise: 10 in Back Rise: 15 in Leg Opening: 16 in Product measurements were taken using size 32, inseam 32. Please note that measurements may vary by size.